Somehow FolkWorld receives only a very limited number of children's music CDs from the English-speaking world (and other parts of the world). This time there is only one CD in this column, from Newfoundland. This comes with a call for any folk bands out there who do quality childrens music to think of FolkWorld!!! Meanwhile there is a regular and comprehensive supply of CDs with children's music from the German speaking world. Is this maybe because the German children's music scene is more of an organised industry, with many of the key children's music makers being joined up, with a "Kindermusik" website and a regular e-newsletter with news and tourdates for all members? If you are interested in this, have a look at www.kindermusik.de. 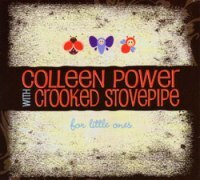 The one album we have received is an album from Canadian singer-songwriter Colleen Power. When her daughter was 18 months old, she loved listening to a tape of Crooked Stovepipe, a Newfoundland bluegrass band. And from that came the idea and desire to record with Crooked Stovepipe a CD with children's music. When Colleen approached the band, they agreed! So here we have an album where Bluegrass meets Country meets Traditional meets Children's songs. There are a couple of well-known children's titles - "Muffin Man" and a Medley of songs in the "Twinkle Twinkle Medley". Most of the other songs are contemporary children's songs written by Colleen or other contemporary songwriters. And there are also three songs in French - including the well-known traditional "Sur le Pont d'Avignon". Certainly bluegrass is a danceable music style which will appeal to children - and so will this album. Despite all of this, overall this album does not have necessarily a too "childreny" feel about it - it is though an album with very good music and an appealingly wide range of styles which is likely to apeall equally to children and adults. Hopefully I will be back next time with a wider range of English Folk4Kidz titles!